Sometimes I wonder why they come. Why do they bother to make that difficult journey every day? I imagine them in their tiny homes, getting their kids ready in the morning and that in itself, no small feat as twisted bodies are not easy to dress. Twisted bodies do not bend and turn with ease as you try and pull on a beautiful dress or snazzy shirt. Most people have no idea how difficult it is to dress a body that is different. How careful you have to be so that the tiny bones do not snap when you try and force that arm into a shirt. Try putting on your shirt without bending your arms or head and you will quickly figure out what I am talking about. 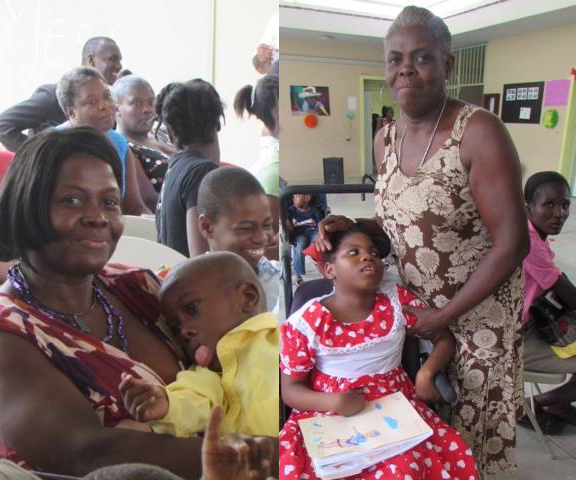 Twisted bodies of these beautiful boys and girls and these beautiful children make up our rehab programs in Haiti. Still I am imagining them in their tiny homes. All dressed up and ready to go. Heave the heavy child in your arms and try and figure out the best way to have you and her comfortable. Gently cover the head so the hot sun does not bother your precious charge. No taxi waiting blowing his horn to take you to the clinic! A crowded Tap Tap – (covered pick up truck) is your taxi and here you must be agile to get in without either of you falling. Now the interrogation begins! What is wrong with your child? Why are you wasting your time with this useless thing? Are you stupid? Can’t you see it will never be any good? What about your life? Are you going to be a slave to this thing? Madam, keep away from me with your handicapped child. Why don’t you just leave it somewhere? It’s not worth your effort to do anything……….Father forgive them for they know not what they are saying. So you sit there with your child and you sit in silence because who will ever understand your love for this child. Let them talk, let them humiliate you and your child, let them! The tap tap has stopped and you must get out. Yippee! You get to repeat this whole experience because you must take another tap tap. In fact you will need three tap taps in all before you get to your destination and even then you will have to walk through the busy market area for about twenty minutes. Then you will have arrived. Imagine all the compliments you will have received before you have reached our door! Good for you! Emily – for years now your mother has struggled and struggled and look at you now! You are so much better. In fact we all thought you would die and how we rejoice in your life. Another will look at you and just see all that you cannot do. But we know different. We know you wanted to live and your mother Dieusimose wanted you to live. We know all her sacrifices – just for you. She calls you Laza (as in Lazarus) because she knows you came back from being almost dead. Still they come and this is what counts. They come and we try very, very hard to help their kids and support them. We do what we can do; they do what they can do. It will never be enough. But we will keep on doing it because we have undertaken this journey and together we will go as far as we can! Please share with others by commentating on, liking and sharing the post. Thank you everyone for the support! !